The bee had had a huge amount of exposure as a symbolic motif during the 17th century papacy of Urban VIII, being the emblem of the Barberini family to which he belonged; but it was to have a further period in the sun during the 19th century – this time in the service of an emperor. The Napoleonic bee was one amongst a group of emblematic objects which were chosen in committee, with the emperor as the deciding voice, in much the same way that the logos of commercial brands are chosen today. The Barberini, of course, had also actively chosen the bee (instead of their original emblem, the horsefly); but in that case it had been by way of a short hop to a more acceptable and aesthetic version of an insect – one with Biblically-recognized connotations of industry, productivity, purity and healing. ‘The Empire wished to blaze in reputation with a brilliance which surpassed both the solar light of the monarchy, and of the Age of Reason’ . Marie José Mondzain, in the essay from which this quotation is taken, makes the point that while the French monarchy had ruled (as in Britain, until the Civil Wars of 1642-51) by divine right, the Emperor was ‘autolegitimized’: i.e. ‘he shared his power with the gods, to whom he considered himself equal’ . ‘Napoleon took the Romans and Egyptians as rôle models, which allowed him to use every antique motif to shed lustre on his normal surroundings’ . Through this choice he was able to harness the classical past to his chariot, without confusing his ornamental vocabulary with the goût grec of Louis XVI. In the example above – the frame on the tapestry portrait of the king after Duplessis – the goût grec taste has been softened by a garland of flowers, and bent to the service of the ancien régime by the trophies on the crest – the French crown, sceptre and royal standard, with fleurs-de-lys, and the hand of justice. 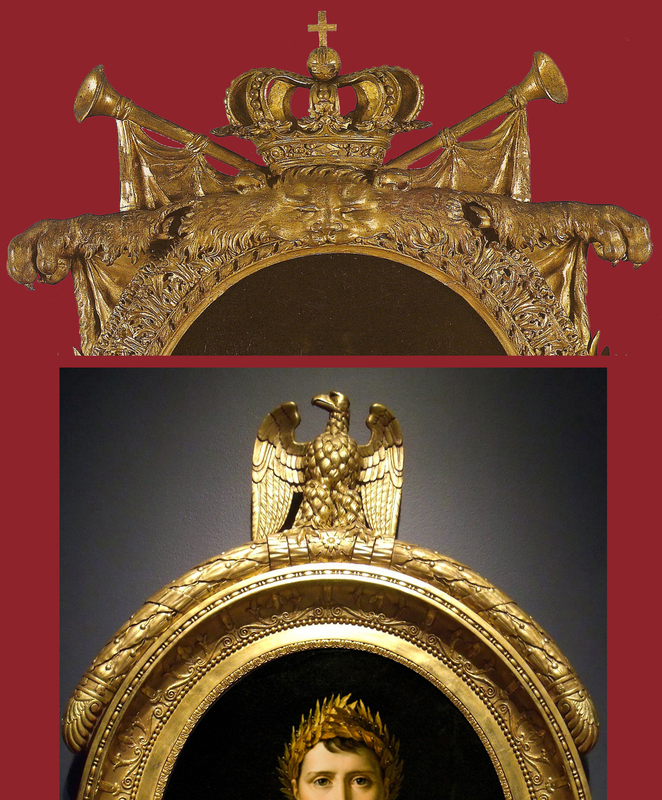 In contrast, the frame on Gérard’s portrait of Napoleon at the top of this article has three of the group of motifs chosen at the beginning of the imperial reign and adhered to throughout: the Roman eagle (which also nodded to Charlemagne), a garland of bay leaves for the victor, and the Merovingian bee . These motifs were embedded in an imperial decorative scheme which was Roman rather than Greek, drawing on the ornamental taste of Nero’s Domus Aurea and of other Roman remains which had been published during the latter half of the 18th century by Robert Adam in Britain, and by Lodovico Mirri in Rome . The delicacy of this style of decoration was admirably suited to the new technology by which it was reproduced: in other words, whilst frames under the ancien régime were hand-carved and very sculptural, and had been produced through the blood, sweat and tears of the monarchically-oppressed carver, répareur and gilder, Empire frames were more simply and swiftly made, with plain mouldings which could easily be decorated with applied pressed ornament. ‘In order for… the acts of the Senate and the laws they produced to be valid, they had to have an official seal. It was therefore necessary to create a new seal to replace that used under the Consulate (a figure of Liberty in a Phrygian bonnet)’ . A committee was covened from amongst the Conseil d’État, headed by Emmanuel Crétet; the minutes of its meeting on 12 June 1804 record the short list of heraldic animals drawn up – eagle, lion and elephant (along with the French cockerel, which got short shrift from the emperor for being ‘low’ and ‘weak’). Napoleon inclined to the lion, but was persuaded instead by Vivant Denon to adopt the eagle, with its overtones of earlier empires, Roman and Carolingian. The other major item in immediate need of emblematic adornment was the coronation robe, for which a sprinkling either of bees or of fleurs-de-lys was suggested. Fleurs-de-lys were fraught with tradition, but also with the memory of the monarchy; and those in favour of bees persuaded the others that ‘fleurs-de-lys were only badly-drawn bees, and had been substituted for them by this distortion being misunderstood’ . Therefore, when the official counter-seal was actually engraved, it was centred on Jupiter in the form of an eagle with a thunderbolt in its claws, framed in the chain of the Legion d’honneur, a helmet at the crest with open visor and imperial crown, the hand of justice crossing the sceptre of Charlemagne, and mantling draped behind in the form of the coronation robe . 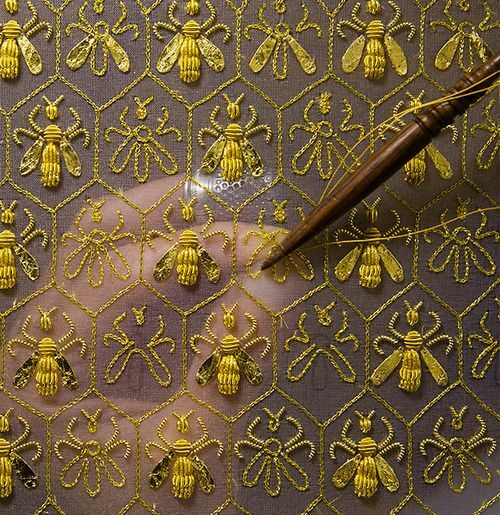 This robe was lined with ermine inside, and decorated thickly with serried rows of bees on the outside. ‘Now that they accustomed to burn or bury with them, things wherein they excelled, delighted, or which were dear unto them, either as farewells unto all pleasure, or vain apprehension that they might use them in the other world, is testified by all antiquity… and beyond the content of urns, in the monument of Childerek the first, and fourth king from Pharamond, casually discovered three years past at Tournay, restoring unto the world much gold richly adorning his sword, two hundred rubies, many hundred imperial coins, three hundred golden bees, the bones and horse-shoes of his horse interred with him, according to the barbarous magnificence of those days in their sepulchral obsequies’ . Sadly, Childeric’s treasure was stolen and most of it melted down in 1831, the bees illustrated above being the only two survivors of the original three hundred; but in 1804 the well-read members of Napoleon’s committee must have been aware of this tangible golden connection with the Merovingian kings who ruled (and greatly expanded) the Frankish empire from the 5th to the 8th centuries. In the 5th century Tournai was in the western arm of Childeric’s realm; now it is in the Netherlands, on the border with the north-eastern corner of France; and in 1653 it belonged to one of seventeen provinces of the Spanish Low Countries, collectively under the rule of the Holy Roman Empire in the person of the Archduke Leopold William, brother of HRE Ferdinand III. 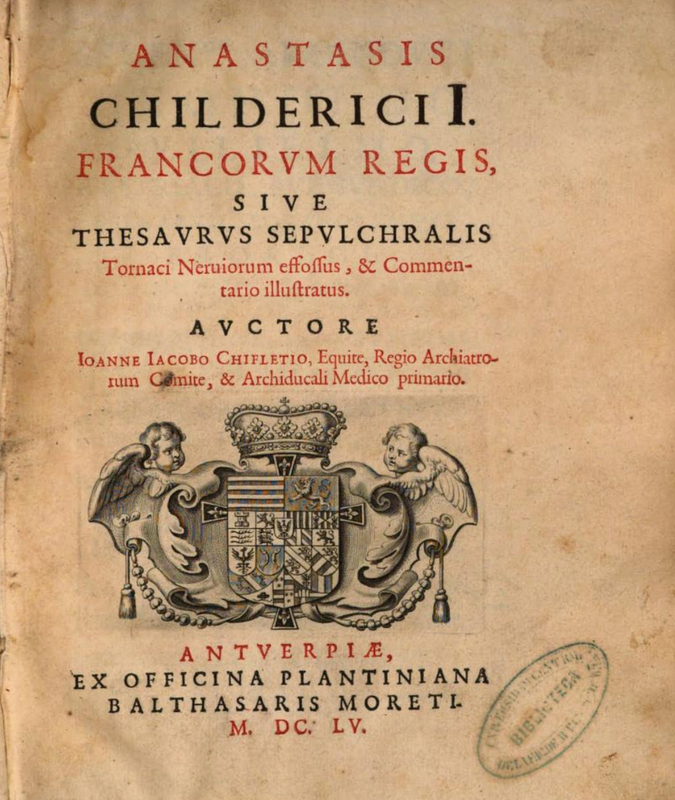 The court physician to Leopold was a Burgundian, Jean-Jacques Chifflet, who was asked to investigate and catalogue Childeric’s treasure, and two years after the discovery of the tomb he published a treatise on it (in Latin), with engravings made from his detailed drawings: Anastasis Childerici I: Francorum regis… It was he who determined that the bees are bees; he described them as all three hundred coming from the tomb of King Childeric; as having bodies of pure gold set with glowing rubies, and as having neither antennae nor feet . ‘The Merovingian bees also contributed to establishing [Napoleon’s] historical legitimacy’ . 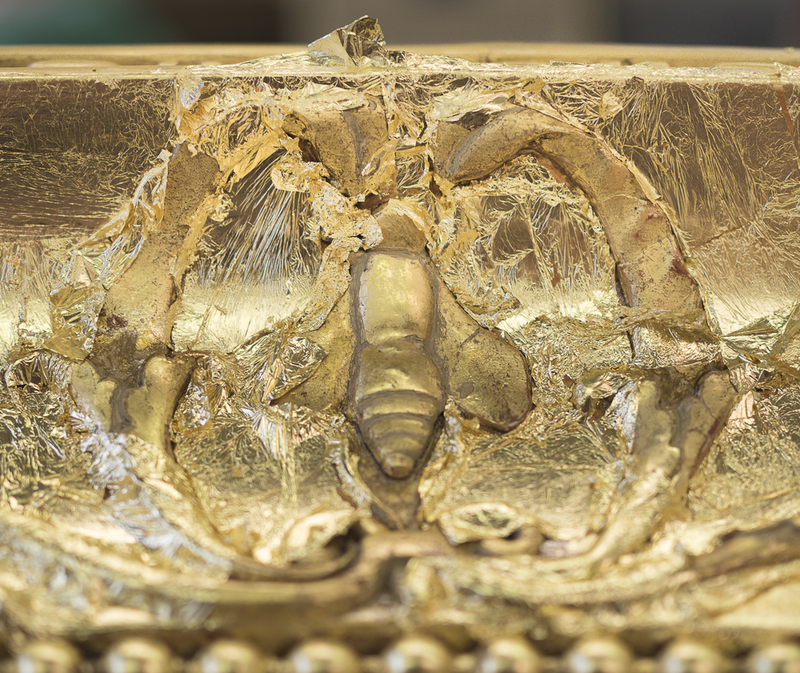 The fastenings at the back of Childeric’s bees implied their attachment to some sort of fabric, and possibly to the ceremonial mantle in which he was presumably buried. The committee of the Conseil d’État having decided that the robes of both Napoleon and his empress as well as the coronation hangings should also be decorated with bees, the job of designing them was given to the artist Jean-Baptiste Isabey (1767-1855) – although with the proviso that the bees from the tomb should not be rigidly adhered to as models: they were much too small to have the grand effect needed in Notre-Dame, and in the throne room of the Tuileries . Childeric’s bees were not slavishly copied as to their materials, either; three hundred gold and garnet bees might have done for the burial of a king, but Napoleon’s France had been at war for five years, and needed to exercise discretion in the matter of solid gold. Gold bees in quantity are also heavy, and would have added considerably to the weight of robes and hangings, so the coronation bees were made of bronze and of gilt wire. After the coronation, the imperial emblems diffused through the applied arts in a metaphor for the increasing power of the emperor; although the armorial bearings were confined to official areas. 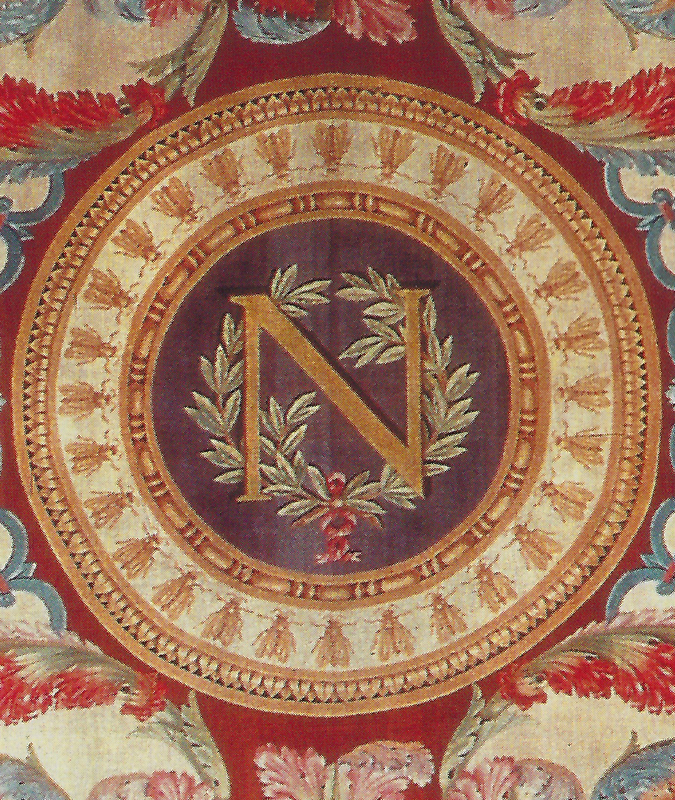 Just as with the Barberini, for whom the Arazzia Barberini produced tapestries with trompe l’oeil ‘frames’ decorated with bees, so the Manufacture de la Savonnerie produced carpets in the Empire style for Napoleon. 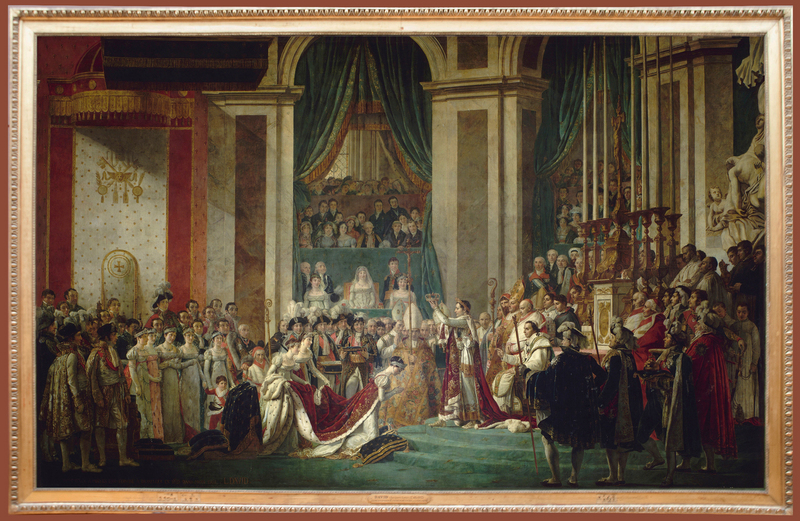 The most notable was the vast carpet commissioned in 1806 for the chamber of the Conseil d’État in the Tuileries, and used in 1810 for the throne room of the palace on Napoleon’s second marriage. It was designed by Charles Percier and his pupil, François Debret, and executed between 1807 and 1809. Only the central crest now remains in the Louvre – a circular medallion with the eagle on a blue ground, crowned, and framed twice – by the chain of the Legion d’Honneur, and by a wreath of imbricated bay leaves. However, the carpet was rewoven, and the replica given to the King of Saxony in 1809. 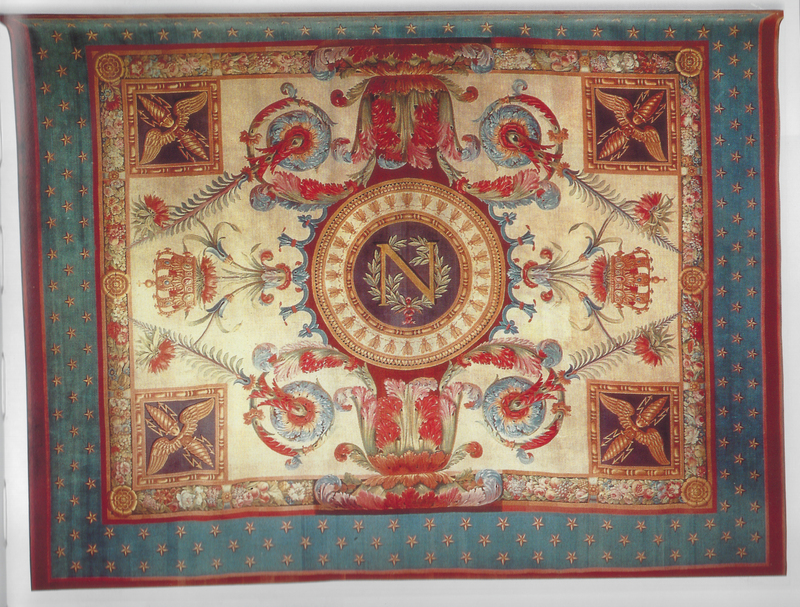 One of the side panels of this second carpet is now in the collection at Malmaison (above); it has a central medallion echoing that of the eagle, with the emperor’s cypher of an ‘N’ in a wreath of bay leaves. This is bordered with trompe l’oeil architectural ‘carved’ mouldings of rais-de-coeurs and astragals-&-beads around a central frieze ornamented with twenty-eight bees. The whole medallion is a beautiful woven analogue of a NeoClassical frame, just as some of the Barberini tapestries incorporate Baroque frames and mouldings. Further mouldings in corner cassettes hold winged thunderbolts, standing in for the eagle; and the whole panel is ‘framed’ again with a garland of flowers inside a wide frieze of stars on a blue ground. The bees, as well as evoking Napoleon’s putative link with the Merovingian empire, form a dancing circle of industrious, productive workers, which balance the militant Jovian thunderbolts beyond them. This was the beginning of the 19th century, and wall-hung tapestries were no longer quite such a natural decorative medium for reproducing paintings with ornamental borders as they had been in 17th century Italy, when the Barberini pope, Urban VIII, could have whole cycles of tapestries produced, as well as portières and baldacchinos. The Manufacture des Gobelins, which had woven so many tapestries for the ancien régime in France, ran into trouble during the Revolution and was temporarily closed. 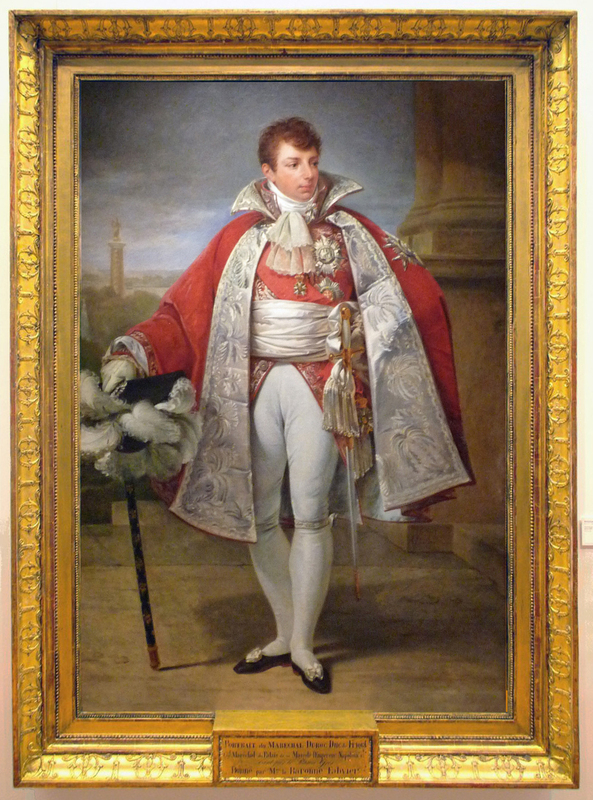 Napoleon revived it – partly with the apparent purpose of reproducing his own image in wool, notably Gérard’s portrait in his coronation robes, which was executed as a full-length and a bust-length version , but sadly without an integral frame in either case. Some pictorial tapestries were also produced, but these lost their borders under the Restauration, when the eagles and bees were replaced by Bourbon motifs. 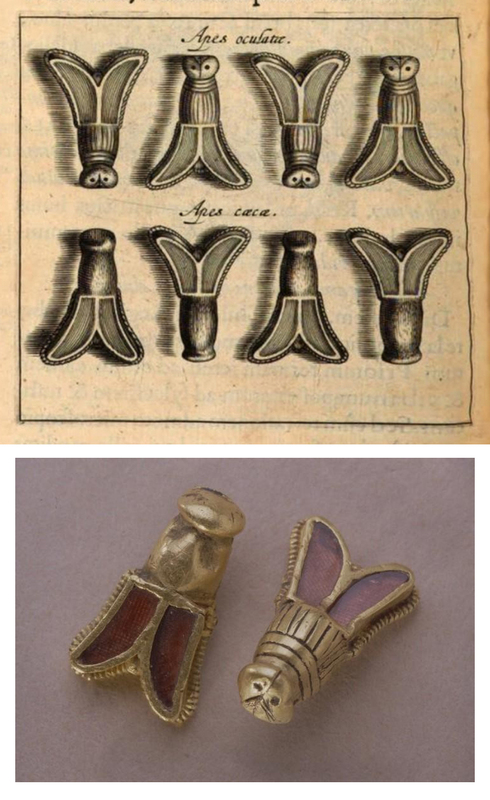 There are, however, portières which incorporate bees: the mainly ornamental, where the bee is used almost purely decoratively, as an allover diaper , and the grand armorial version, updating those made in the 17th and 18th centuries for Louis XIV-XVI which feature the loves of the gods, military trophies and symbolic motifs . 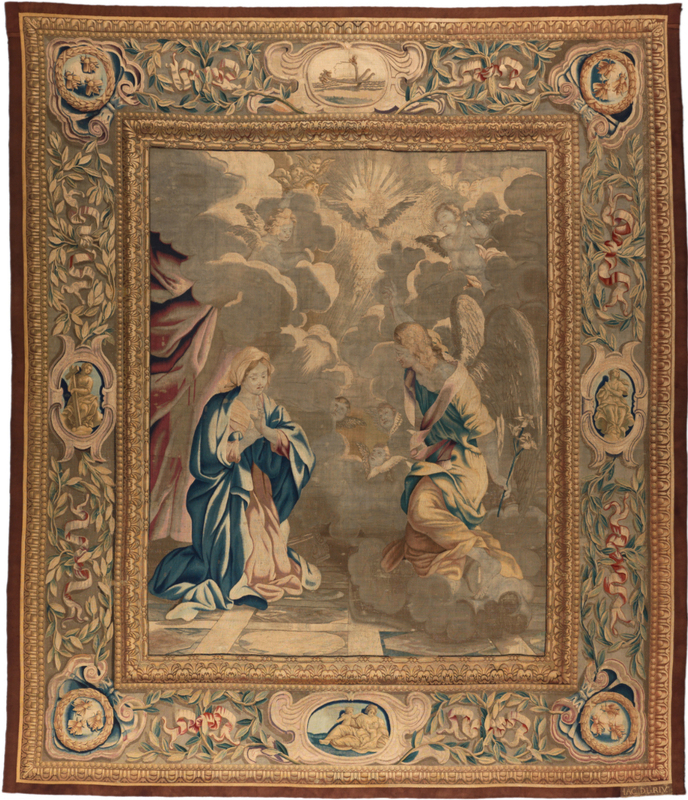 This example (above) was woven for the Grand Cabinet of the Tuileries, as one of a series of six masking the various doors . 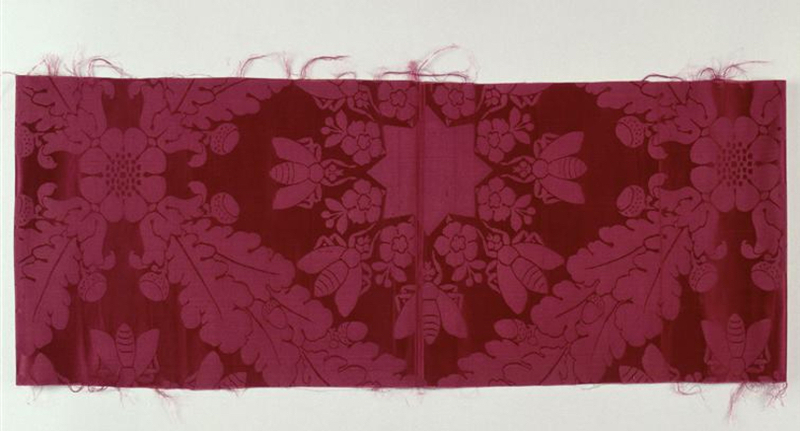 It is almost indecently replete with bees: they are scattered at regular intervals over the crimson background; they cover the coronation robe, which hangs like mantling behind the coat of arms with the imperial eagle; they replace scattered stars on the wide azure valance across the top of the portière; and finally they are incorporated into the ‘frame’ with its architectural trompe l’oeil mouldings which border the tapestry on three sides. Here they decorate blue plaques between golden palms, with the ‘N’ cypher in corner cassettes. 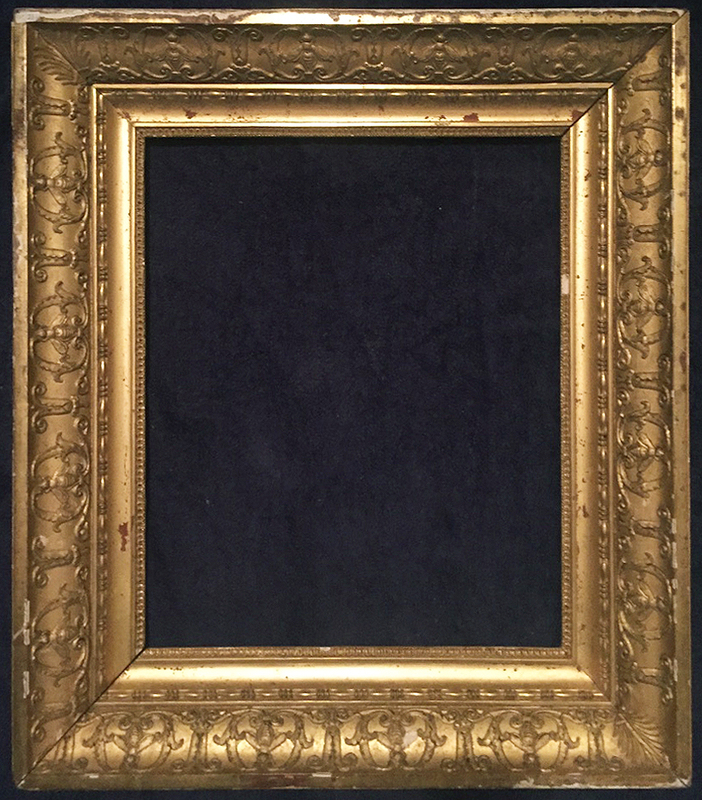 The dark gold of this frame forms a rich contrast with the azure valance at the top and the crimson background of the imperial arms. As a carved frame it would be relatively simple: an architrave structure, depicted as very shallow, its flat central frieze providing a rich but not excessive border in which the bees stand out powerfully against their blue grounds. This simplicity – and its grand scale – provide a strong foil for the opulent, complex ornament of the armorial bearings inside. 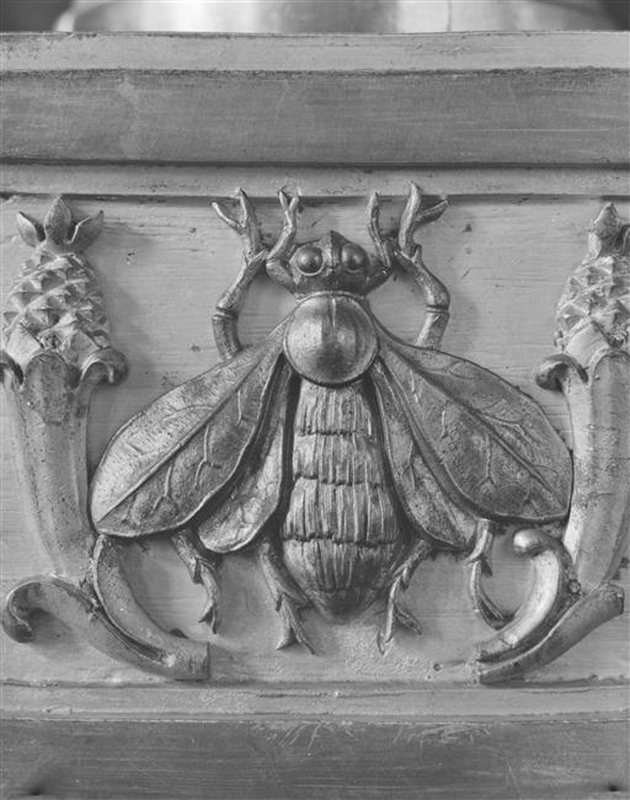 The spectator is left in no doubt as to the importance of the emblems of imperial power, and of the bee amongst the other emblems, given that the portières formed an integral element of the decorative scheme of the Grand Cabinet as a whole. This was necessarily ‘particularly impressive’, since it was where the emperor ‘received not only the great dignitaries of his régime, but also foreign delegations’ . The careful preparation for the pieces woven by the Manufacture des Gobelins can be seen in a surviving cartoon for the border either of a tapestry or another portière. 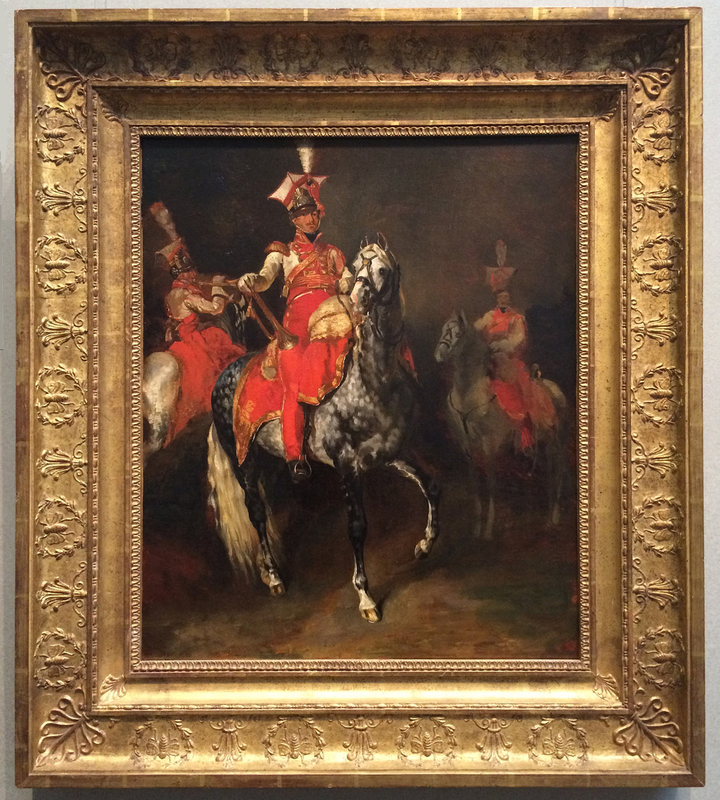 It is by a relative (probably a son) of the Dubois responsible for the weaving of the portière with the Grandes Armes de l’Empire, above, and was painted in oil. It is close to the design of the border for the latter piece, and is even more imitative of a carved wooden frame, with the roundels containing the bee and the ‘N’ edged with a run of rais-de-coeurs within the large bead-&-bobbin mouldings. By the 19th century, it was a traditional solution to the border of a tapestry, to finish it with a trompe l’oeil ‘frame’ of this sort; but it is still a strange mimicking, of carved giltwood by soft wool. The bee in this cartoon gains even more presence from having a roundel, rather than a mandorla, in which to spread its wings, and looks more like giltwood itself. The cartoon is undated, but given Dubois’s date of birth, in 1796, it was unlikely – although possible – that he produced it for the First Empire. 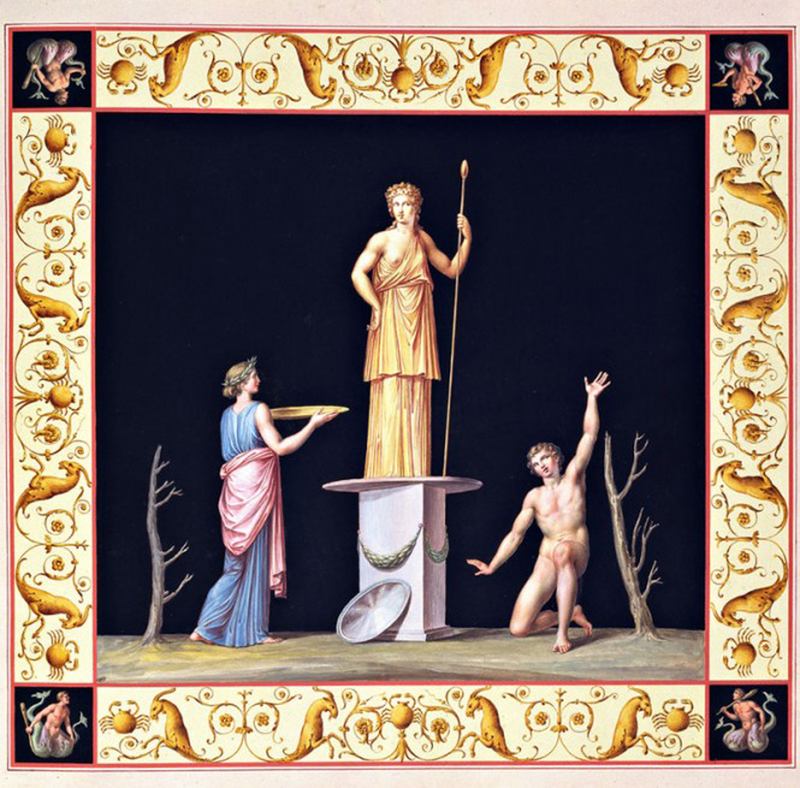 He might well have drawn it for the Second, which arrived in 1852, two years before he died, thus illustrating the long life of these emblems of power. 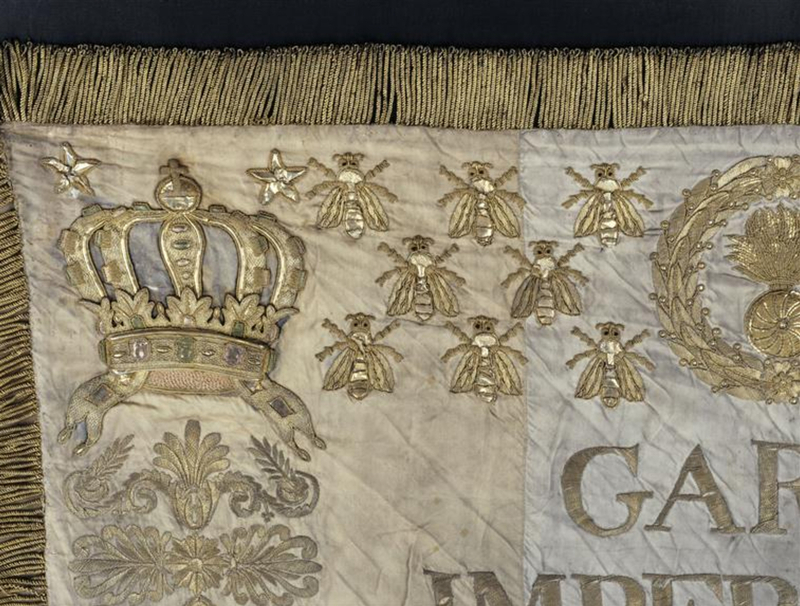 A different type of fabric item with a frame – or at least a border – of bees is the regimental standard, a suitably military celebration of the Empire. This particular example, its red, white and blue stripes faded to a soft mother-o’-pearl, is the flag Napoleon kissed as he left for exile on Elba. It unites the imperial crown in the top corners, the eagle in the bottom corners, the ‘N’ cypher in the lateral centres, the grenadiers’ emblem in a laurel wreath at top and bottom centre, with four panels of bees at top and bottom. 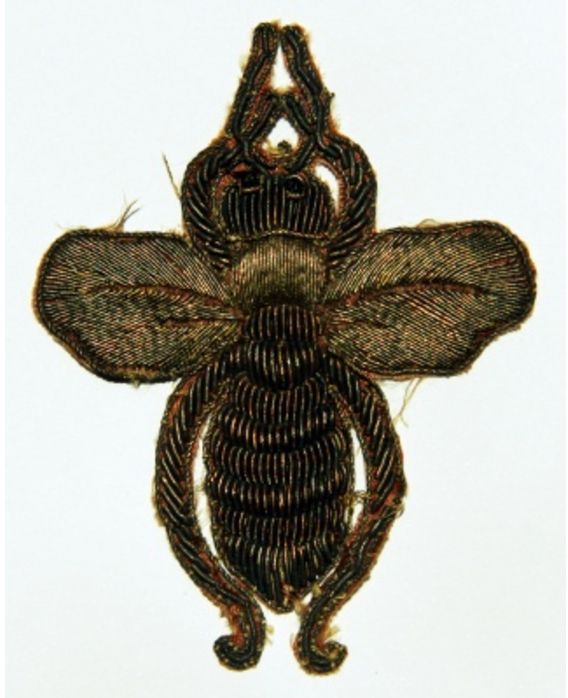 The bees are embroidered in striking detail, with eyes, veined wings, and – unlike Childeric’s bees, which ‘antennas & pedes non habent’ – these have little antennae and segmented legs. Seeing this detail in a relatively small compass also highlights the very different designs of bee which surfaced on various imperial surfaces: these will be dealt with at the end of this article. Other textiles were produced, using the imperial emblems: for instance, looser circles of bees, freed from their architectural frames, surround the stars and flowers on this silk damask; they are held in a diaper of oak leaves, which – like the stars – are secondary motifs in the vocabulary of Empire symbolism. Oaks and bay leaves are often found together, or alternating in decorations; they blend strength and power with victory and poetry, whilst the bees add sweetness and industry. 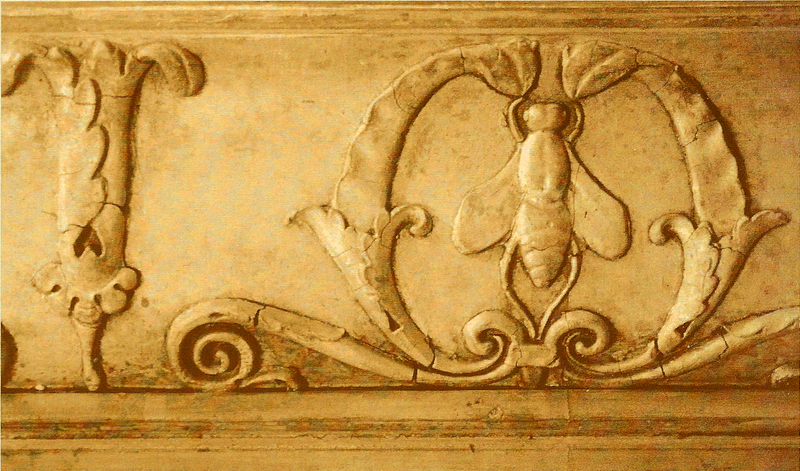 Although bees were scattered prodigally over backgrounds and other areas of ornament in fabric and furniture, bees appearing on decorative borders (in analogues of the portière and carpet) are rare, compared with – for instance – the sculpted, frescoed and architectural frames bearing Barberini bees. 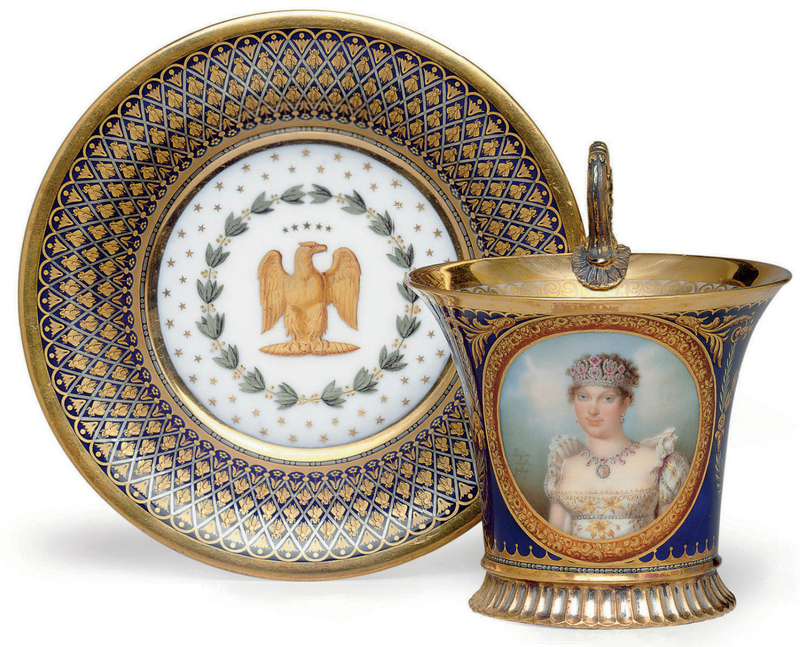 One example of a framing device on a piece of decorative art is the border of a Sèvres saucer, with Napoleon’s second empress, Marie-Louise, on the cup. The saucer is decoarted with the imperial eagle, surrounded by a perfect swarm of bees in a trellis-work diaper. There is an astragal-&-double bead ‘moulding’ around the inner gilt edge of the border on the saucer, and again at the bottom of the cup, above the fluted foot, pointing towards the origin of this form of representation in the carved giltwood trophy frame, and showing how ornamental techniques (or their representations) diffused through extremely diverse items and materials. 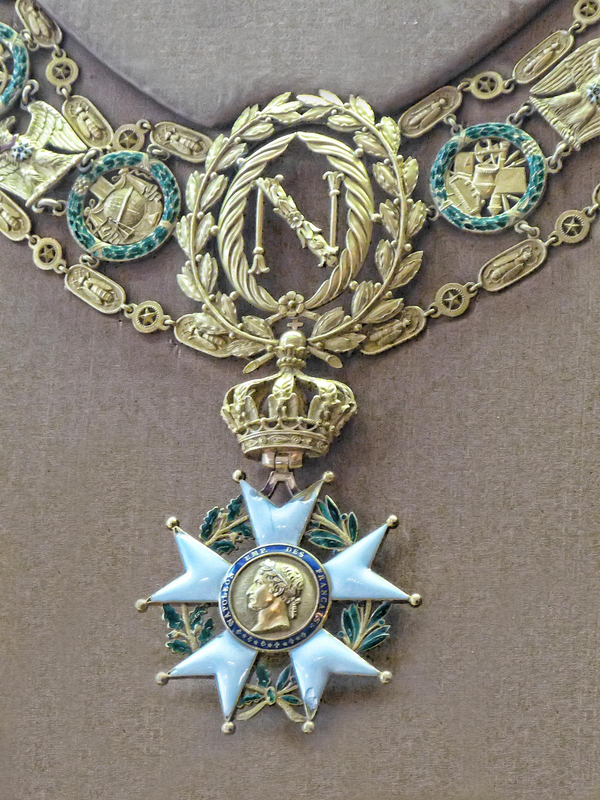 Similarly, the chain of the Legion d’Honneur might equally be seen as a frame; in this case for the very real head of the emperor, who wore this particular version of the order. 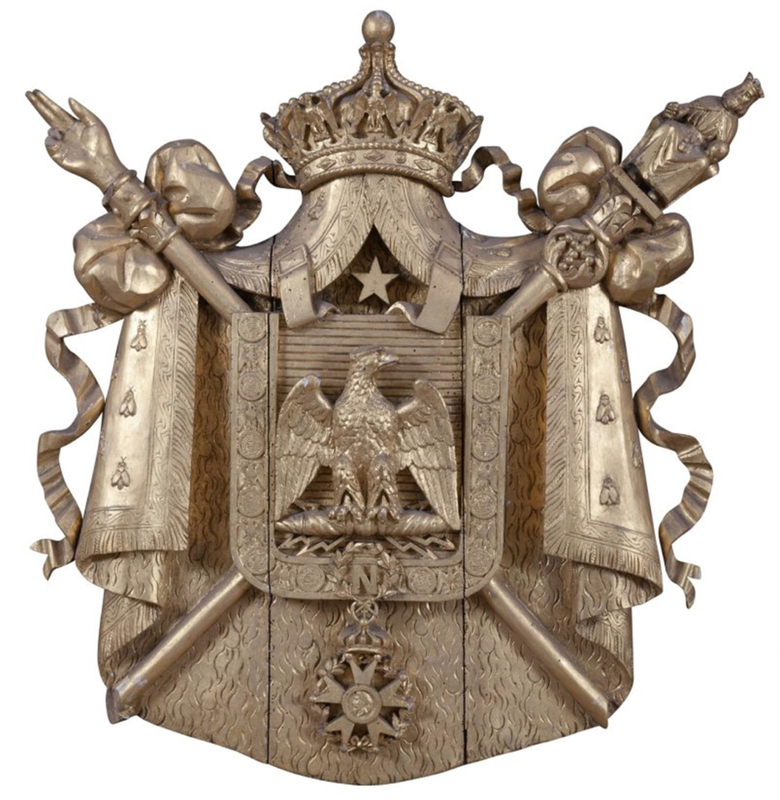 It uses the same group of emblems – the imperial crown, the ‘N’ cypher in a wreath of bay leaves and palms, the eagle, and the bee. 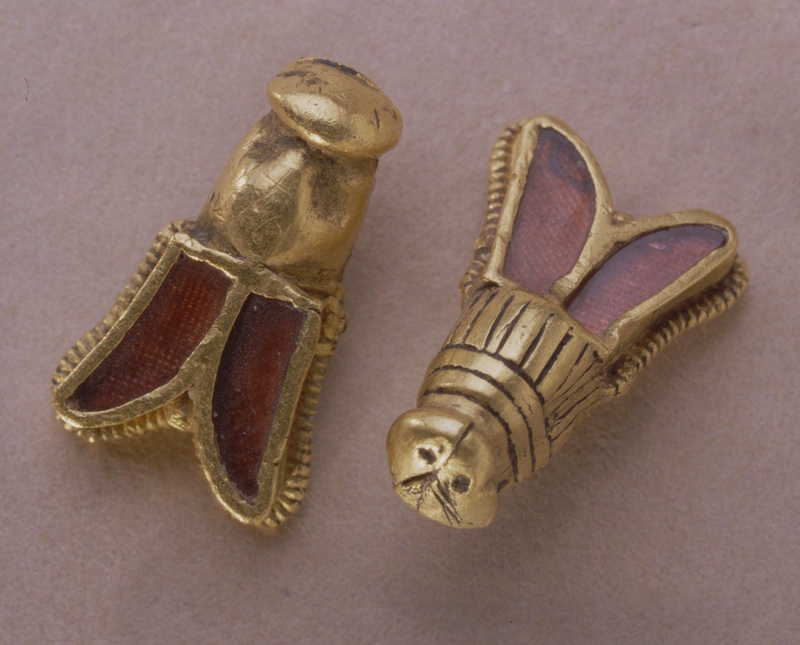 These bees are long and narrow – stretched out like elongated scarabs on Egyptian cartouches, forming links in the border of the chain, alternating with other links with stars. 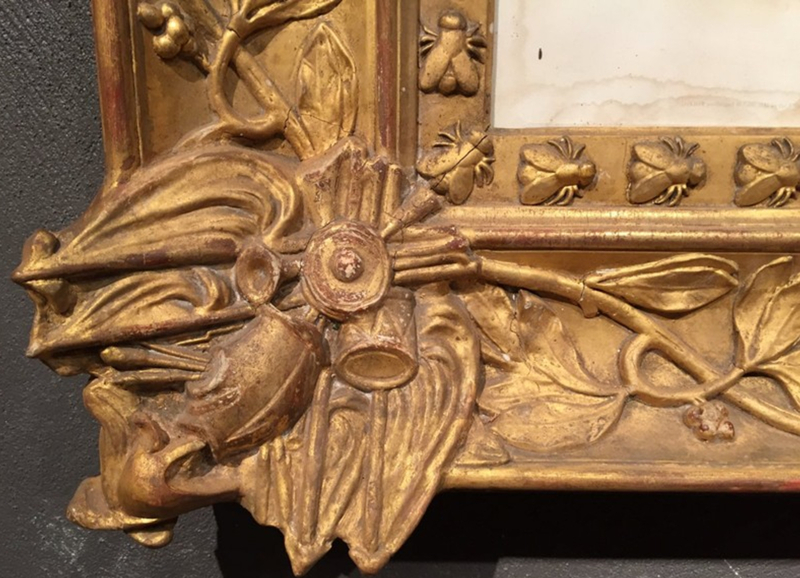 Again, as with the Barberini, there are conventional picture frames with bees – and again, due to the reframings occasioned by changing ownership and tastes, few of these have survived with their original contents. 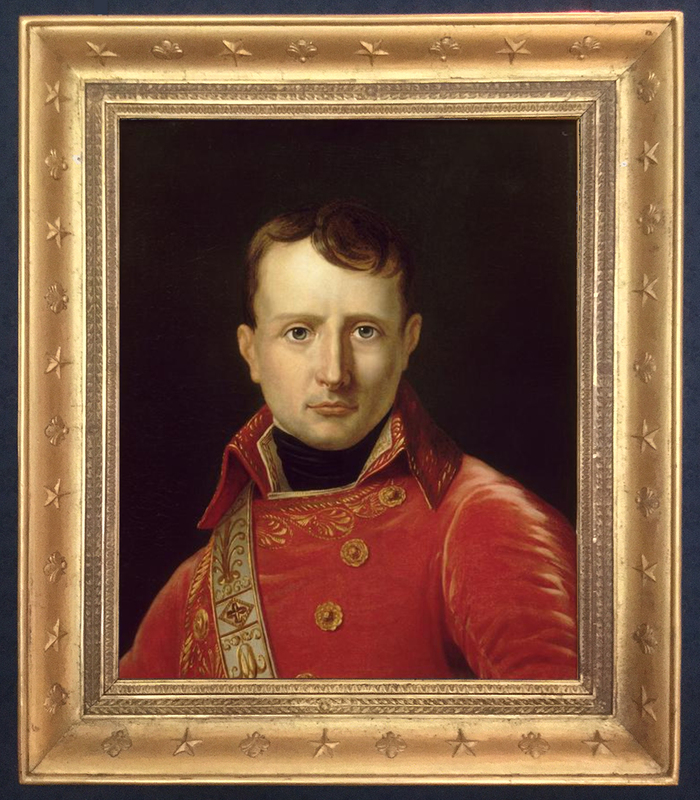 To begin with one of the earlier representations of Napoleon in a bee frame, there is a portrait of him by Joseph-Marie Vien (father or son) in the collection of Malmaison, dating from around 1803. 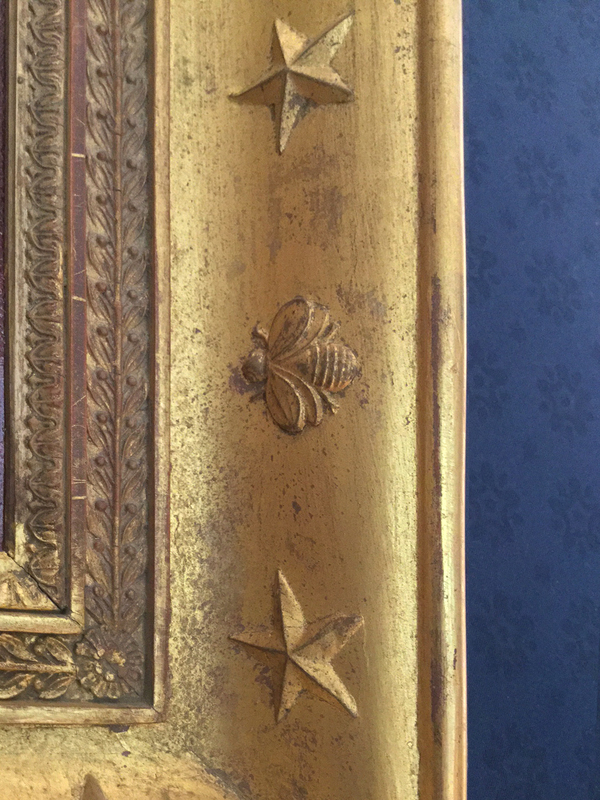 The frame has a nice simple ogee profile, studded chastely with alternating moulded plaster stars and bees, a run of a vertebrate branch of bay leaves centred on and springing from corner rosettes, and rais-de-coeurs at the sight edge. It makes a splendid setting for the young Napoleon, in his red velvet uniform and sash embellished with palmettes and anthemia, the suitability only heightened by the echo of the rosettes in his brass buttons. 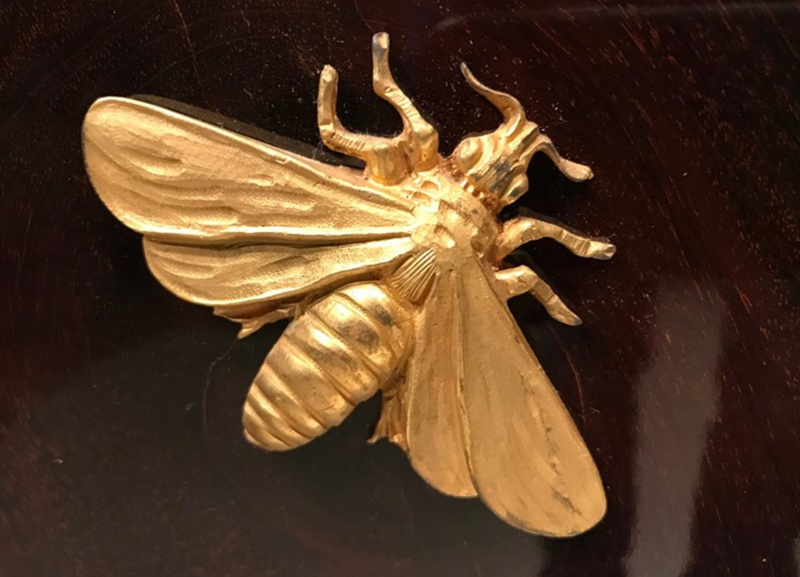 Unfortunately, the Premier Consul would not have had bees as an emblematic motif on a contemporary frame; bees – as noted above – were instituted as an imperial emblem at the time of the coronation, in 1804, and did not appear publicly until December of that year. Moreover, the frame has been reduced at some point, the rosettes at the centres of the bay leaf branches now no longer aligned with the actual centres of the rails . It has also been stripped back and regilded with a matte finish; so that the burnish and patina of the original finish (above) have disappeared. 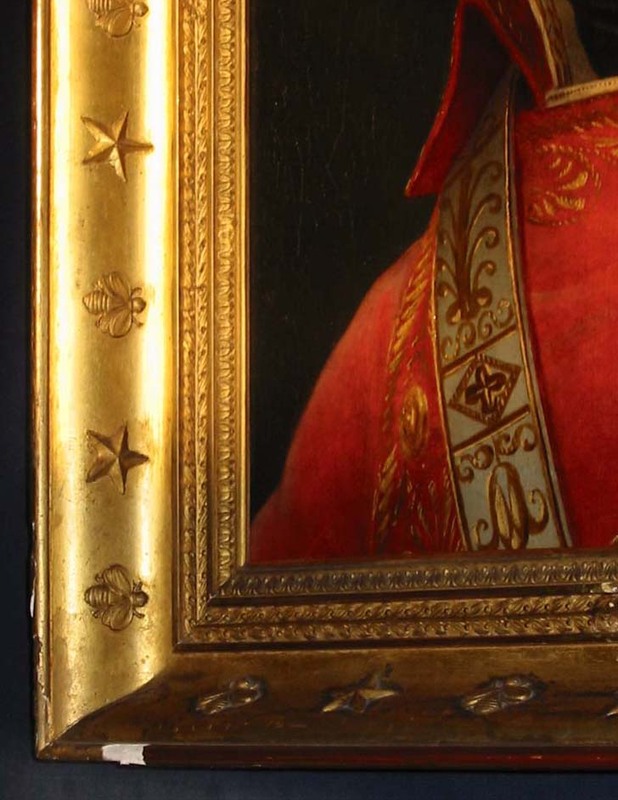 It may have been a frame associated with a later (and slightly larger) portrait of Napoleon, or of one of his family; sadly, its history is now almost certainly lost. The bees are short and fat, with spread double wings and wonderfully stripy bodies – an anticipation of Disney bees; the bay leaf branch is a characteristic Directoire and Empire ornament. 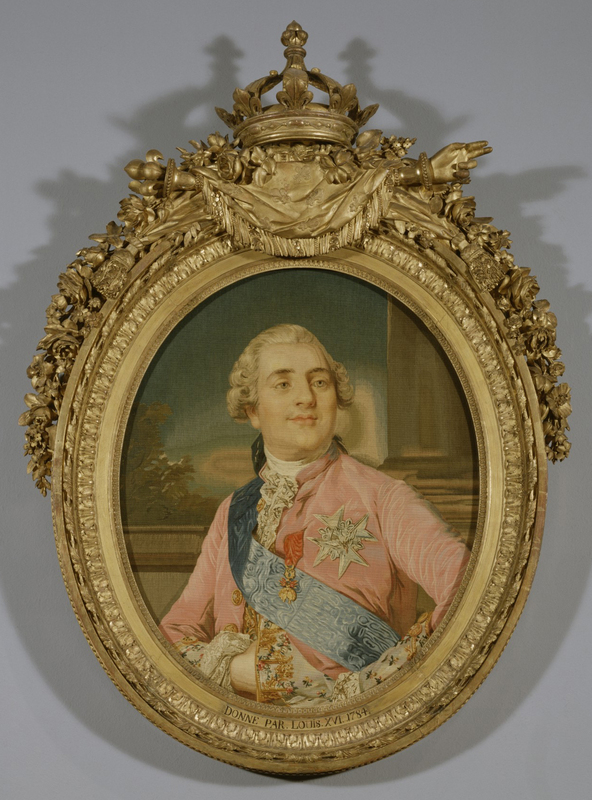 An early Empire frame with bees – which does seem to be original to the painting it holds – contains Gros’s second portrait of Duroc, the Grand Maréchal du Palais, a replica of the work commissioned by the emperor in 1804 as one of a series to celebrate the coronation. The original portrait is at Versailles; the version above is the copy painted the next year by Gros for the family of Duroc. The bees on the frame indicate that it is an official imperial commission; they are particularly well designed – fluid and elegant, held within the opposed C-scrolls of two anthemia or honeysuckle flowers, reaching up to pull down the tips and sip the nectar – they embody the idea of the Empire as fruitful and generous. They are moulded in plaster, now fragile and cracking, but still exhibiting a refinement and delicacy of detail. 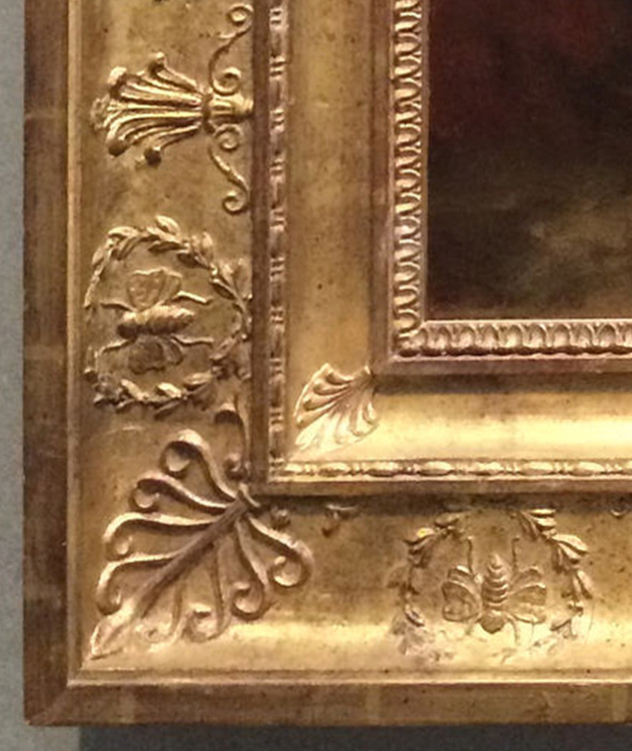 A bee frame with almost identical decoration may perhaps be associated with the same commission from the emperor, or with other imperial portraits. Unfortunately it has been unskillfully reduced, ruining the corner anthemia at the top right and bottom left, which is a great shame, given the scarcity of these historic patterns. 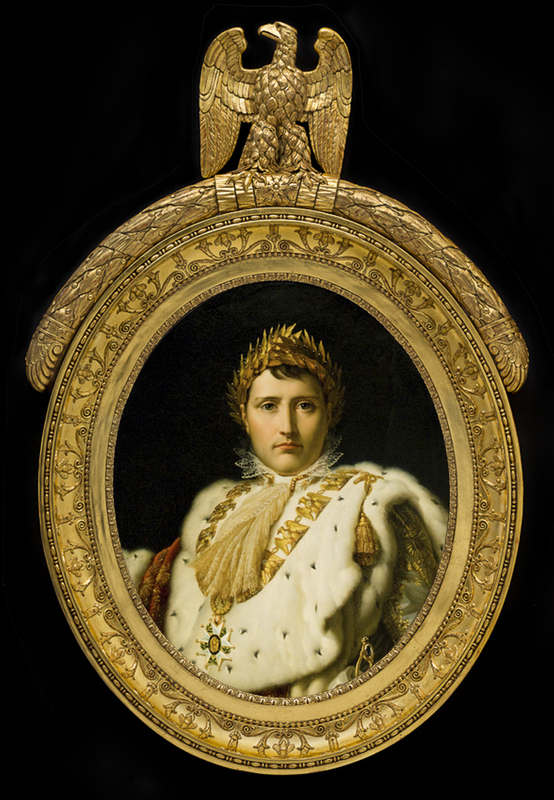 The most remarkable contemporary example of this pattern is the oval trophy frame on Gérard’s portrait of Napoleon in coronation robes, at the head of this article. It has been regilded several times, and has recently been undergoing restoration in order to be included in an exhibition of 2018, Napoleon: the Imperial Household . The hollow is decorated with exactly the same motifs of C-shaped honeysuckle flowers enclosing a bee, alternating with lilies, as on the previous two frames; it is defined by runs of bead-&-bobbin and pearls, with rais-de-coeurs at the sight edge. The fronton is dramatically different, however; the imperial eagle (proportionately large in relation the portrait) is perched on the top, its wings slightly raised as though it has just settled there, its head alert. It stands on a sort of roulade of imbricated bay leaves, which is curved around the top of the frame and bound with crinkled ribbons. At the centre, between the eagle’s claws, is the imperial French cockade of the army; and the bay leaves are finished at each end in three-dimensional palmettes and leaves, which give the appearance of lion’s paws. 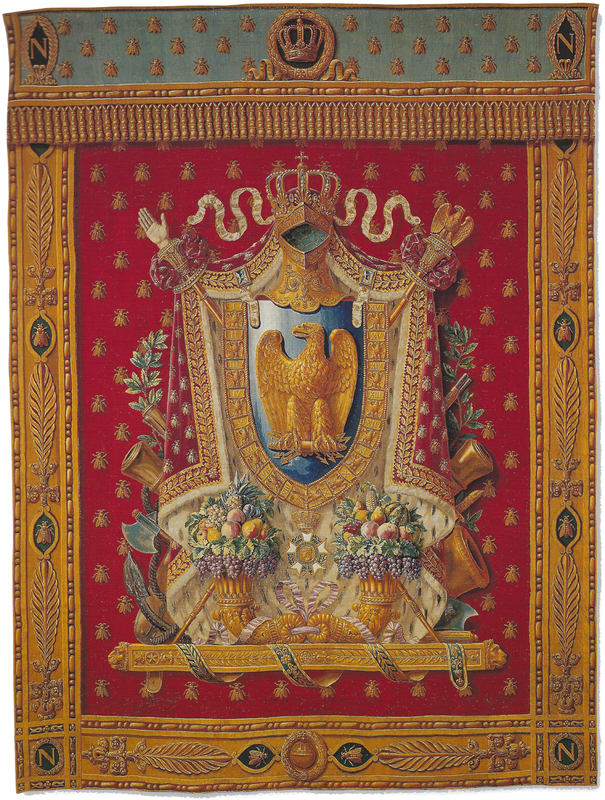 Thus all the major emblems of the Empire are united in the frame – eagle, bay leaves and bees – with the cockade to indicate Napoleon’s position at the head of the army. 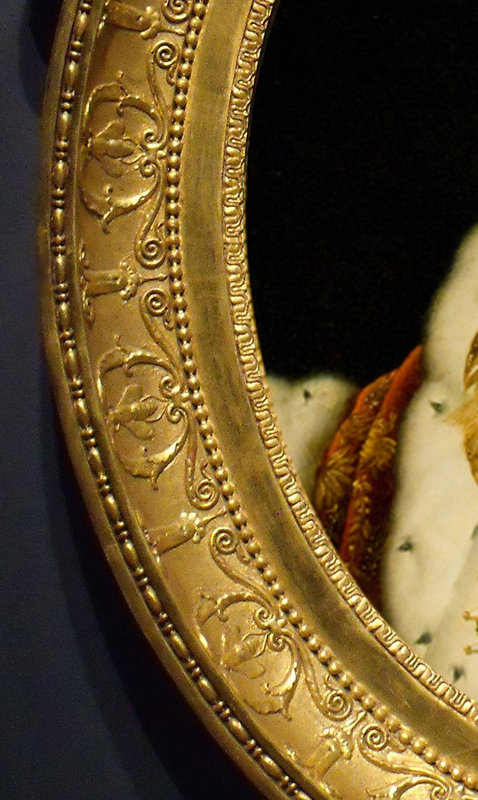 These details put the frame of Gérard’s portrait firmly in the line of descent from those on other representations of supreme monarchy. 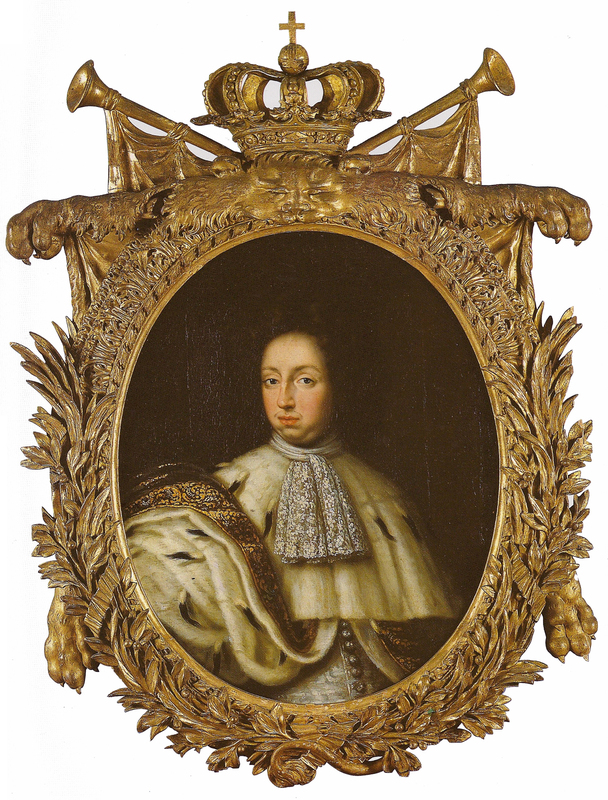 If it is compared with, say, the frame of the 17th century Swedish Charles XI, it can be seen as the updating of a very traditional royal trophy frame, rather than a radical rethinking of the medium for a new imperialism. The roulade of bay leaves and palmettes (which does look at a glance so much like a pair of lion’s paws) seen from this point of view may be a stylization of, or a sly reference to, the skin of the Nemean lion, worn by Heracles as a cloak, and apparently draped (in a mad trompe l’oeil jeu d’esprit) over the back of the Ehrenstrahl portrait, as though the king were actually wearing this symbol of semi-divine strength and power. 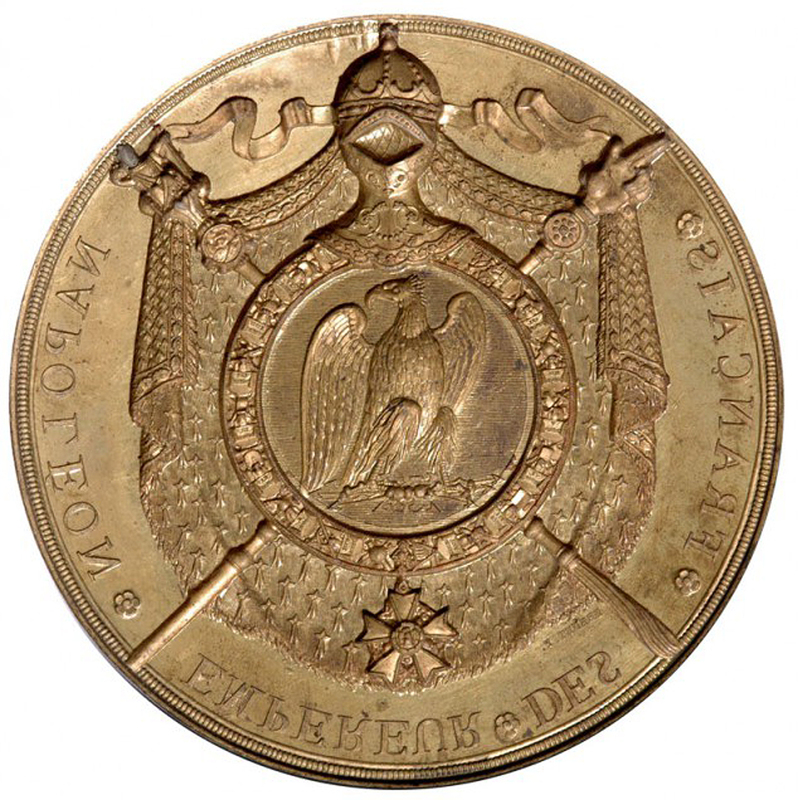 For Napoleon, the eagle replaces the Swedish crown; it recalls the Roman emperors and also Charlemagne – and an emperor naturally trumps a king. It should also be remembered that carved crowns on the crests of frames are there because the king in the portrait beneath is bare-headed: he is thus shown to be in the process of coronation before the spectator’s eyes, reminding the latter of the oath of loyalty taken by the king’s subjects as part of the coronation ceremony. 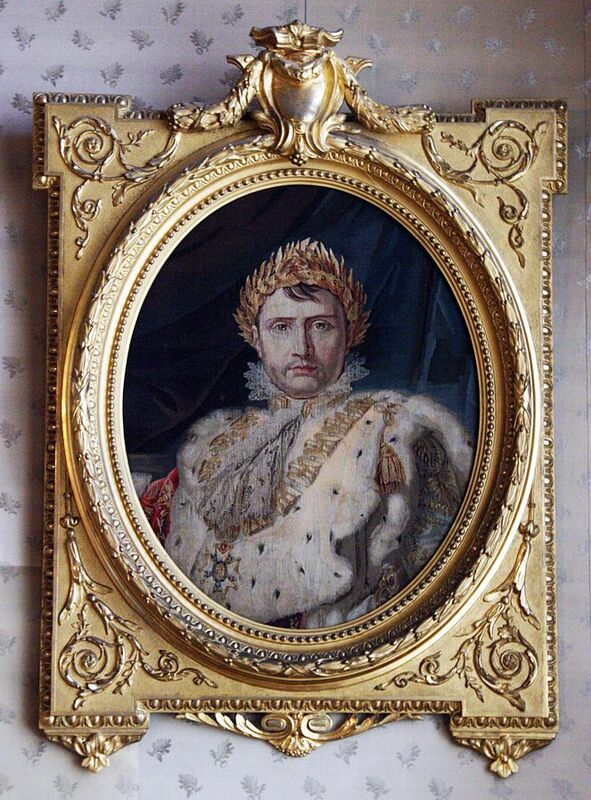 Napoleon, on the other hand, is painted wearing his imperial crown of gold bay leaves (melted down in the Restauration): he has already been crowned, and presents himself to the viewer as his or her emperor tout court. The bees reinforce this message: not only Caesar Augustus and Charlemagne (with a hint of Heracles), but Childeric (the forefather of the Merovingian empire) stands behind the emperor of the French; together they form a phalanx of ancestral ghosts, supporting him with symbol piled on symbol. 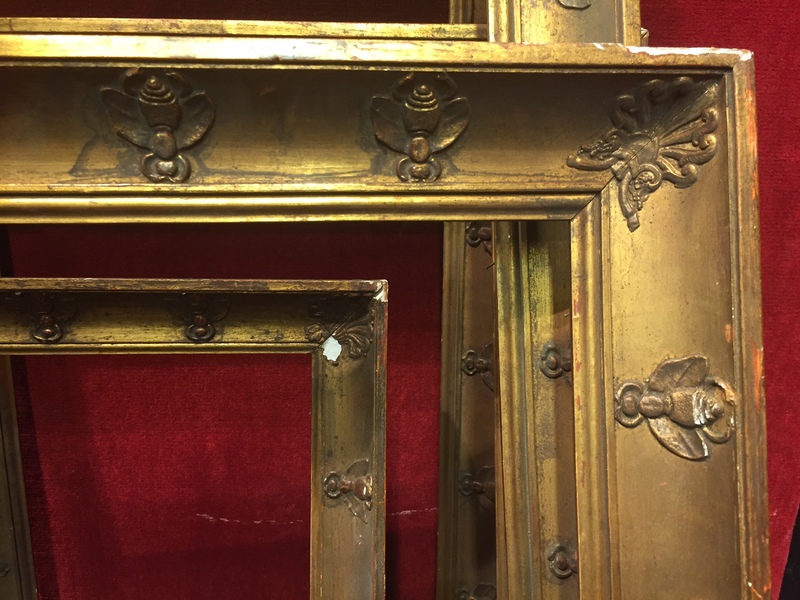 The bees on all three of the frames shown above may be based on the same source as a decorative motif from Jacob-Desmalter’s lit de parade at Fontainebleau, made for the emperor slightly later (in 1809), and striking in its fully-realized naturalism. The bee is in the same position, but is much more 3-dimensional and undercut; it has segmental legs, eyes, veined wings, and is covered in fur. The two honeysuckle flowers are replaced by little pineapples, as shorthand for a cornucopia. 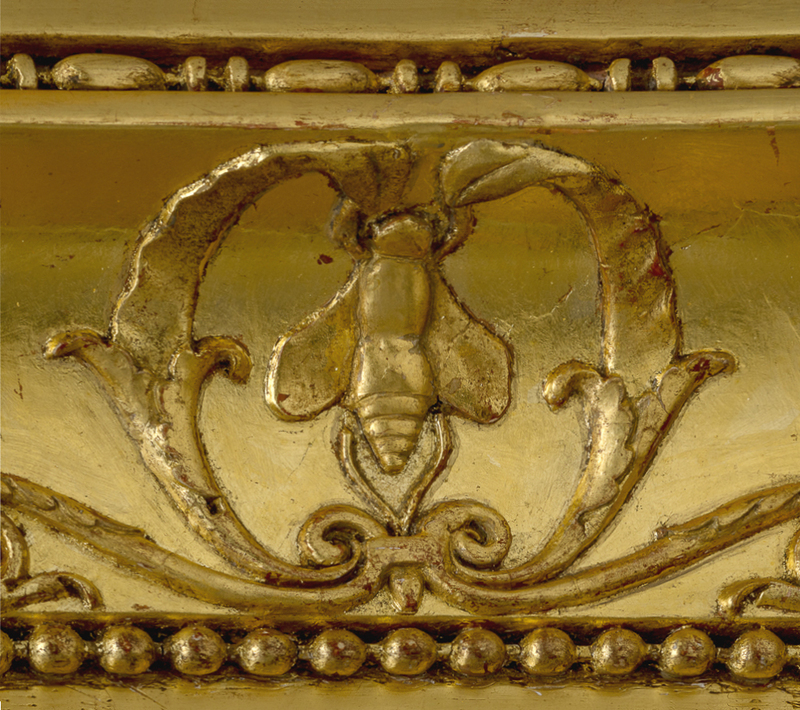 This bee is carved and gilded, rather than moulded, explaining its sculptural, plastic qualities; it was executed several years later than the plaster bees on the frames, arguing that both may derive from the same set of ornamental engravings, or possibly from drawings provided directly, perhaps by Percier and Fontaine. 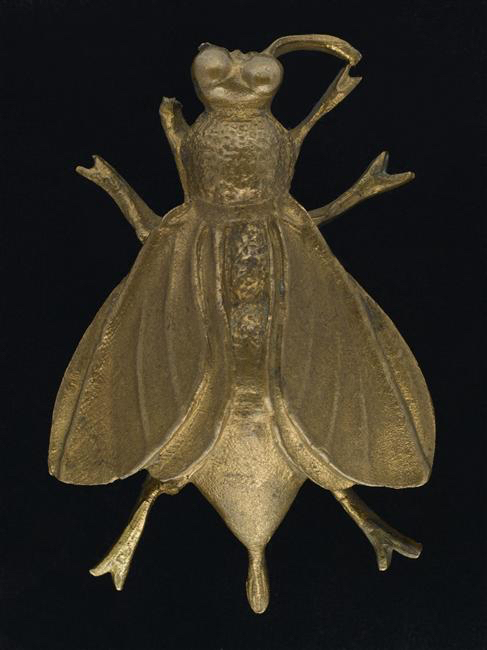 Jacob-Desmalter produced a very similar bee as an ormolu mount for a secrétaire, completing the arc from the very shallow relief plaster bees on the frames, through the carved wooden bee, to a completely free-standing (but tiny) metal sculpture; and also emphasizing the interconnected roots of the Empire vocabulary. Wooden and plaster picture frames are rare survivals; there are also – as well as metal mounts – metal frames. Since Isabey was primarily a miniaturist, and had also been at the heart of the flood of emblematic design associated with the Empire and the coronation, he might have been expected to have produced works which combine, as it were, both his hats. 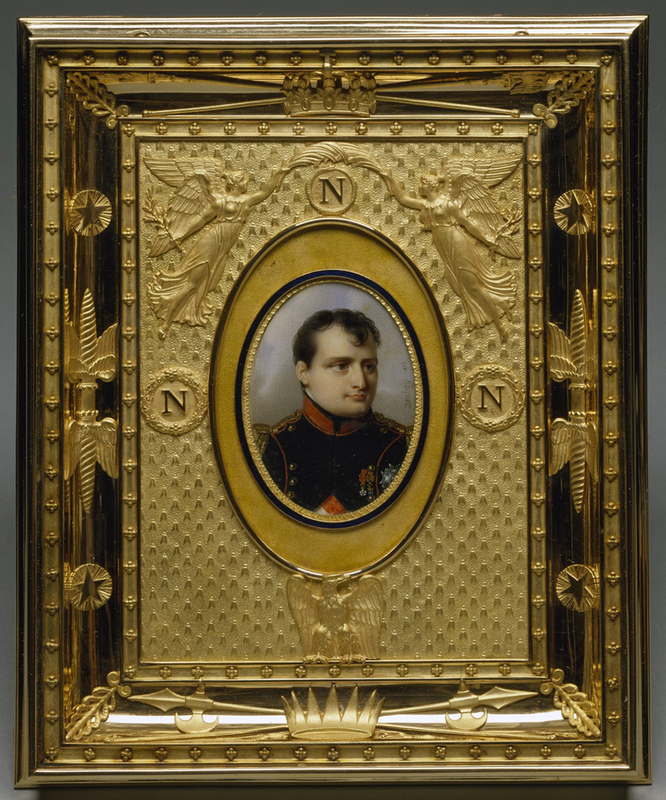 This particular miniature of Napoleon was executed four years after the gold frame around it, but it is still possible that Isabey might also have been concerned in the design of the frame, laden as it is (like the trophy frame on the Gérard portrait) with every possibly symbol of power. The bees in this case are minute, forming an overall diaper on the outer mount of the miniature; this mount may originally have been intended for a slightly bigger painting, which would fill the larger of the two ovals. Unlike many of the appearances of the imperial bee, with opening or widely-spread wings, these have their wings firmly folded, appearing much more like the flies that Childeric’s bees have sometimes been interpreted as. Their miniaturization (so to speak) is balanced by more prominent rôles for the militaristic trophies, including the winged thunderbolt on the sides of the frame. In spite of the number of emblems, the linear form of the frame and the fact that the bees, eagle and winged victories are all embossed in gold on gold, prevent the design from overwhelming busyness, and allow the portrait to stand out vividly. 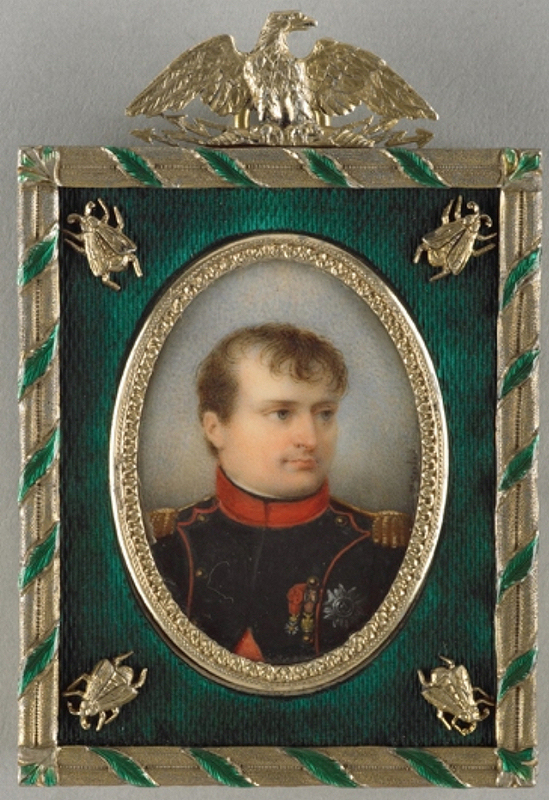 This second image of the Emperor by Isabey and his studio has a perhaps less symbol-heavy frame, but it is equally striking, in its use of silver and green. The strong green makes the red facings of Napoleon’s tunic stand out even more dashingly; it also allows the bay leaf of victory to be shown in its (fairly) natural colour, unfurled from its usual branch, and twisted around the rails of the frame. 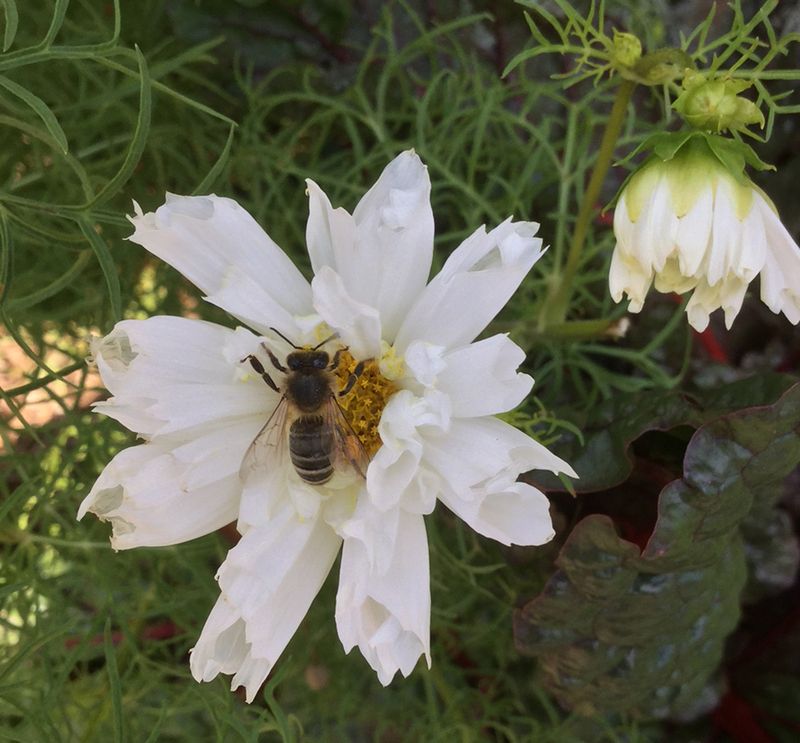 The silver bees are far larger here, and crawl across their emerald field towards the tiny fleurs-de-lys in the corners; they have the regulation six legs and delightfully voluted little antennae. Popelin-Ducarre was married to Napoleon’s niece, Mathilde Bonaparte, the former wife of Prince Anatole Demidoff, and his portrait is either of the imperial prince who would have become Napoleon IV if his father, the third emperor, hadn’t been dethroned in 1870, or more probably of Napoleon’s great-nephew, who lived for much of his life with Mathilde Bonaparte. 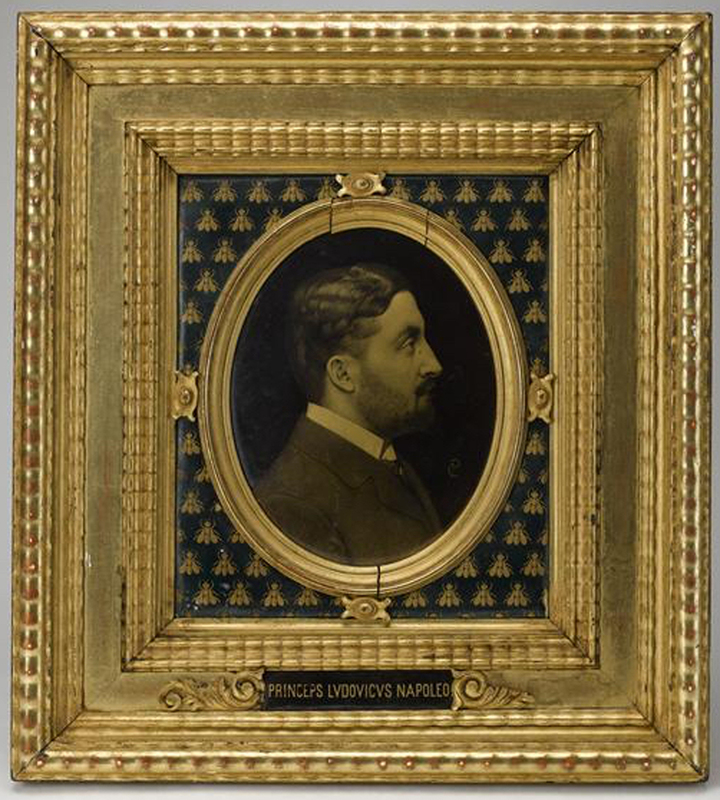 It shows the influence of photography: this enamel could almost be a daguerrotype, and is set chastely in a black and gold enamelled mount, covered in quite large and naturalistic bees, in a gilded frame with ripple mouldings. What it also reveals, more strikingly, is the long life of the Napoleonic bee; although the Empire had been extinct for twenty years when this portrait was painted, the dynastic symbol of the bee had inhered strongly enough to form the natural accompaniment to almost any portrait with Bonapartist connections. It also flourished to some extent during the Restauration, after Napoleon’s final exile to Saint Helena in 1815 and death in 1821. This engraving was produced on the death of the King of Rome, Napoleon’s son and heir, in 1832, and was published with a poem by Victor Hugo linking both deaths, a decade apart. It has a really stunning frame for a print, comprised of a wide hollow filled with undulating branches of bay leaves, with a margin of bees at the sight edge . The corners consist of military standards, corselets, helms, weapons, drums and trumpets, each group ‘pinned’ together by a cockade. All the ornament is moulded, and appears to have survived in remarkably good condition, save for a few cracks. ‘The Greek word ‘psyche’ means at once ‘butterfly’ and ‘the soul’, and in this play on words originates the symbolic richness which it expresses’ . 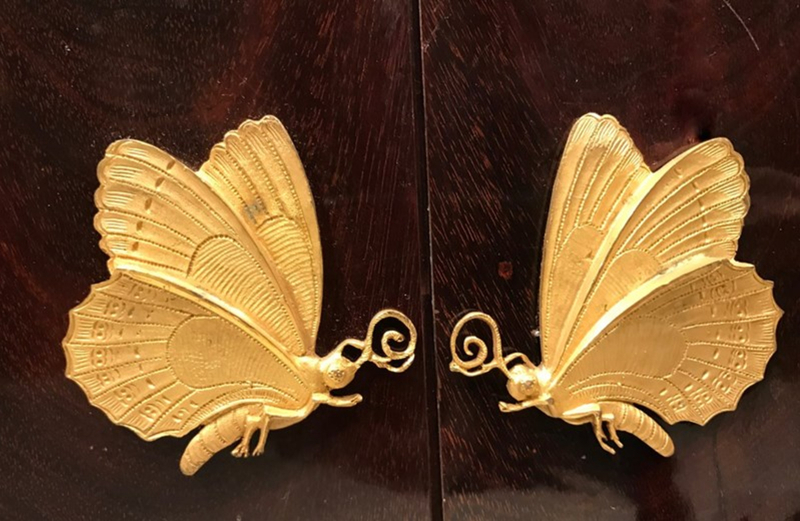 The butterfly was associated in the imperial court with love, licit and illicit, the pains of love and its fragility, the female soul and immortality. It was used in paintings treating the loves of the gods, to decorate furniture and objets d’art, on fabrics, and, perhaps particularly, on china. One rare example of a picture frame decorated with butterflies survives, although presumably not with its original painting, given the subject (its provenance is only traceable to 1937; the frame may have been united with the picture at any point, including by the Gallery). This pattern is more likely to have been designed for an episode of the story of Psyche, a Venus, a Hero and Leander, or perhaps the portrait of a lady of the court. It provides a sort of feminine partner to the imperial bee frame, with the butterfly held in a wreath of leaves, alternating with large urn-like flowers flourishing a central mop of stamens. The inner hollow is decorated only with a palmette at each corner. It is another instance of the migration of Napoleonic emblems onto the frame, demonstrating how central a part of the decorative and architectural interior the setting of a painting was – at least until the second half of the 20th century. 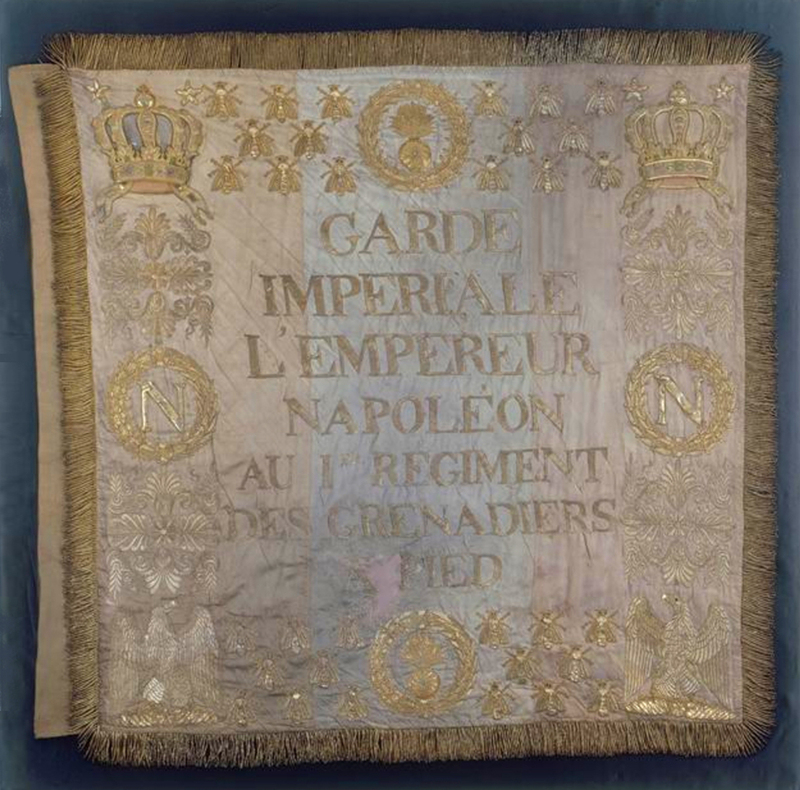 The great and continuing interest in Napoleon and his Empire, which has spawned so many collections of memorabilia, has prolonged the life of the imperial emblems – and the bee, probably, more than all the others. 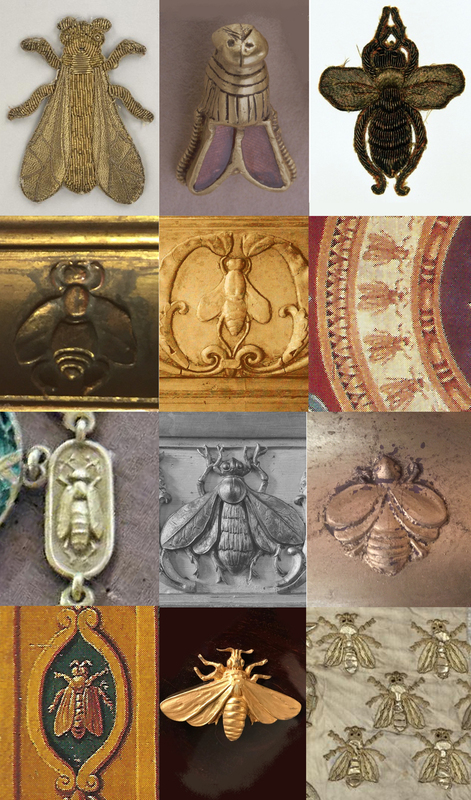 Like the Barberini bee it has survived to decorate many modern items, from cushions and badges to fabrics and wallpaper. The odd frame adorned with bees still emerges, too. In 2016 there was an auction of works of art and antiques from the collection of Bernard Boutet de Monvel (1881-1949) ; it was followed some months later by another, comprising the remaining furniture, sketches, drawings and illustrations from his house and studio, including the artist’s brushes, etc., and several lots of empty frames. 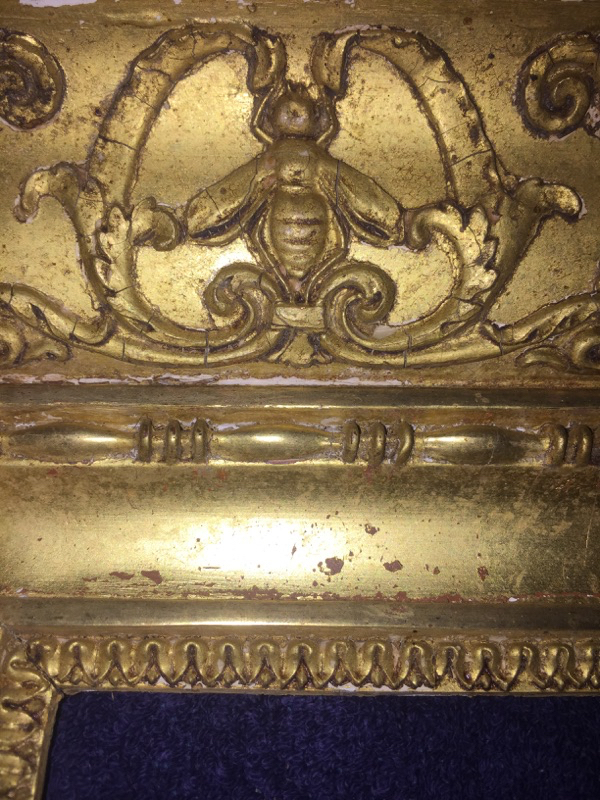 The bees on these frames have nothing like the delicacy and lyricism of their antique Empire ancestors, but they are interesting and ornamental reincarnations of the latter – especially as they appear to decorate working frames, ready either for Boutet de Monvel’s own portraits, or to be used in a decorative scheme. Likewise, after the desert which was the later 20th century, artists have once more begun designing their own settings for their work. 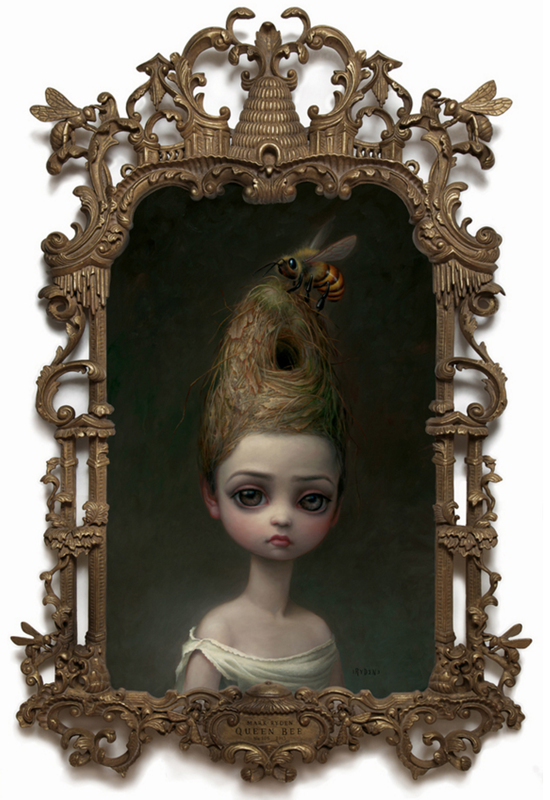 The American ‘outsider’ Gothic artist, Mark Ryden, commissions hand-carved frames for his paintings; this example is copied from a second-hand reproduction Rococo-style looking-glass frame, with bees and a beehive replacing the original motifs. Perhaps these are no longer bees with the echo of Empire clinging to them, but they are still in that long line of emblematic, metaphorical bees which leads back past Napoleon to the Barberini pope, Urban VIII. 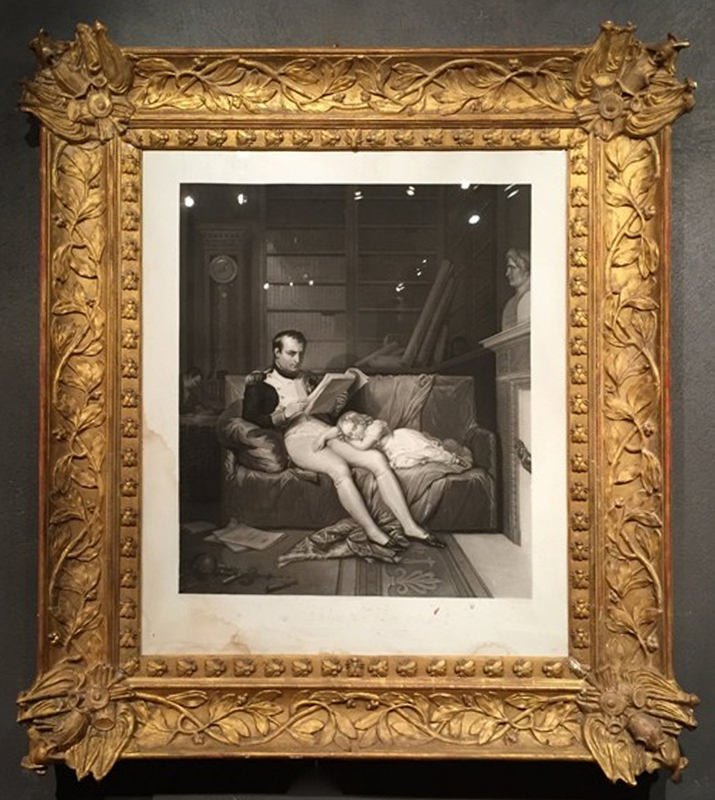 Thank you, too, to Sacha Marie Levay & Christine Guest of the Musée des Beaux-Arts, Montreal, for photos of the restoration of the oval Gérard frame. The bees around the frame of Gérard’s portrait alternate with what may be lilies of a relatively naturalistic kind – very unlike the fleur-de-lys, whilst possibly still subliminally evoking its aura – or, more likely, enlarged honeysuckle flowers (anthemia). This and the previous paragraph are indebted to James Eason’s note on the discovery of Cbilderic’s bees, as well as to the description in Chifflet’s book itself. See Pascale Charron, ‘Les grandes collections françaises de tapisserie : une histoire de la permanence‘: Guy Massin-Le Goff, Etienne Vacquet, Regards sur la tapisserie, May 2000, Angers, France; Actes sud, 2002, pp.43-59. With many thanks to Bruno Hochart for information on the frame, and photographs of it. Napoleon: the Imperial Household, 3 February-6 May 2018, Musée des Beaux-Arts de Montreal; also to be displayed at the Virginia Museum of Fine Arts, the Nelson-Atkins Museum, and the Château de Fontainebleau.